A swarm moved into a bait box I put out a couple of weeks ago. A week’s worth of rainy weather and a busy schedule delayed my check on it until today. Little did I remember that I had only put five frames in the box! 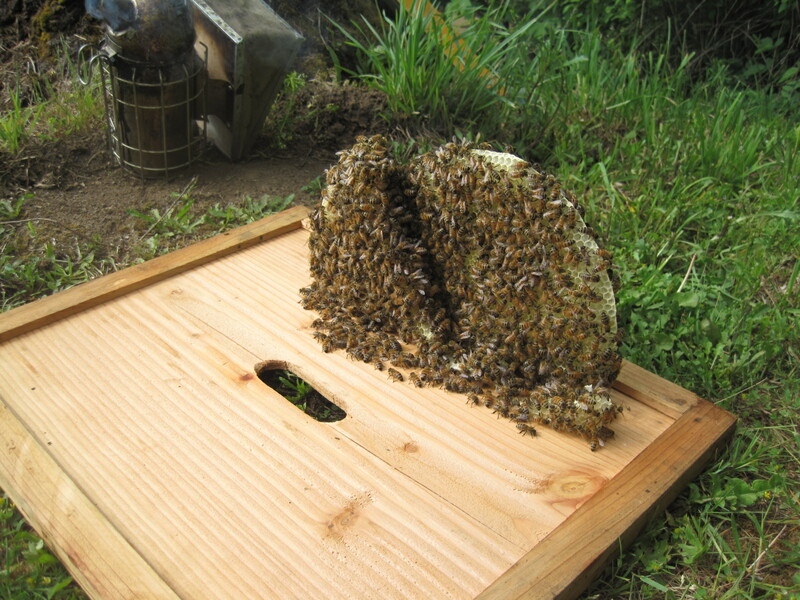 The bees had decided they preferred to build on the inner cover rather than in the undrawn frames I provided for them. I treated the renegade comb as I would had I been doing a removal. I cut the comb off the inner cover with my hive tool and carefully checked to make sure the queen was not on the comb. I then pressed the comb gently into the frame wires and secured it with rubber bands. With any luck, the bees will work their magic, repairing my mess and drawing new wax to more firmly attach the comb to the frame and supporting wires. As it turned out, the queen was on the very last comb I moved. The queen marking color for 2015 is blue, but this girl got marked with purple, a non-standard color that reflects my inability to accurately determine her age. The swarm I caught in this location last year is thriving; I have high hopes for this colony as well. That’s interesting that the bees didn’t use the frames. I was looking at the instructions for building a top bar hive, wondering if it was a better way to go, and how I would get bees to go in it. Then how would you harvest the honey? Have you tried any other kind of hive? I have made a couple of top bar hives but don’t have any currently occupied. Many people use this type of hive; I think it’s a matter of personal preference. My mini top bar–only two feet long–lives on top of my shed as a bait hive. Last year’s swarm went to populate my cousin’s top bar hive. I’ve also used packages to stock my top bar. I am sure someone clever has switched a colony from Langstroth to top bar, but I haven’t tried that yet. I am also baiting with my new Warré hive, but haven’t check on it yet this week. 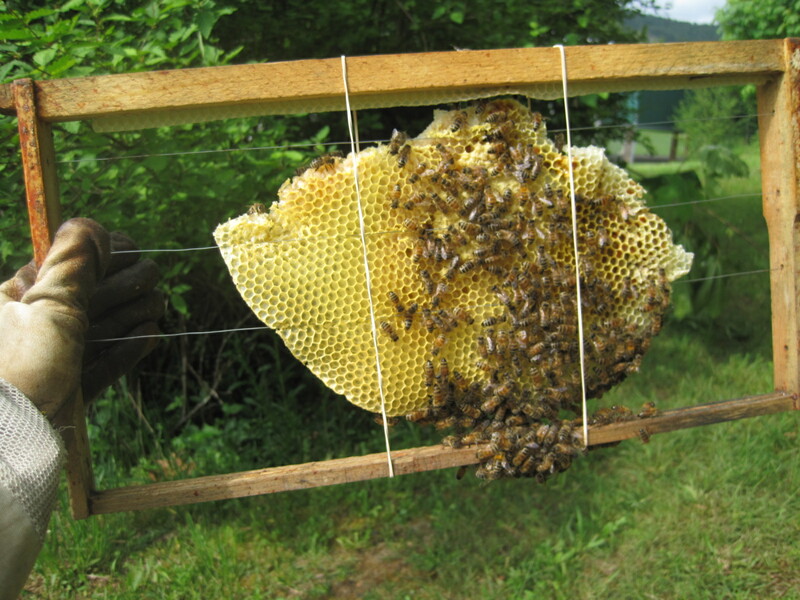 Harvesting honey from both top bar and Warré hives involves crushing and draining the comb. Fun stuff! I didn’t put frames in my bait boxes because I thought bees might think it’s too crowded or small. Last year I caught a swarm in one of the paper mache’ “flower pots”. I hope your comb transfer works! Thank-you, rebecca! I’ve never used one of the paper bait boxes. How did you like it?